Different seasons require you to switch things up. Fall will soon be here, and it is time to start thinking about how you’ll treat your skin during the cooler weather months of the year. As a pregnant woman, you’ve likely noticed a difference in how your face looks due to an increase in hormones. You may be broken out or even notice that your skin looks as though it has a different texture. Don’t worry, it’s perfectly normal to see changes in your appearance while carrying a child. With a little advanced planning, you’ll have no problem putting your best face forward this fall. By accounting for things such as cooler temperatures, increased wind, and even indoor heating, you can ensure that your skin gets the TLC it deserves. You’ll be able to get through the season with greater ease because you’ll know what potentially can cause skin irritations and do your part to minimize them. •	Focus on hydration. Drier air is going to cause your skin to lose its moisture fast. Invest in products that nourish your face and body. Opt for ones that feel cool to the touch and are rich in natural ingredients that are safe for pregnant women. Pretty Mommies products are vegan, gluten-free, estrogenic activity-free, cruelty-free, and Made in the USA. They’re packed full of the good stuff your skin needs during pregnancy. •	Use skin care products that are pH balanced. Enhance the appearance of your skin by doing what you can to prevent inflammation and irritation. 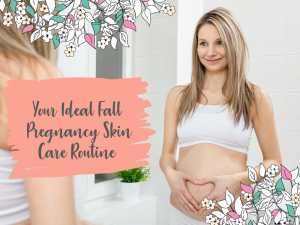 The Pretty Mommies Three-Step Skin Care System allows you to make the most out of your fall pregnancy skin care routine by being comprehensive and accommodating. You’ll have all the products that you need to keep your skin looking its best as the seasons change. •	Keep wearing sunscreen. Even when it isn’t hot outdoors, you’ll still want to make it a habit to wear sunscreen with an SPF of 32 or above. That way, you and your baby are always protected from the sun’s harmful UVA and UVB rays. Even when you spend time indoors under artificial lighting, your skin is at risk if you don’t wear sunscreen. •	Don’t forget to protect your lips. They’ll be drier than usual. Use lip balm regularly. If you can find one that has built-in sun-blocking protection, it’s what you want to keep on hand. After all, you can’t hide chapped lips even when your skin has a beautiful, dewy glow to it. Keep lip balm in your glovebox, purse, and on your nightstand. Restore the moisture that your lips are missing regularly.